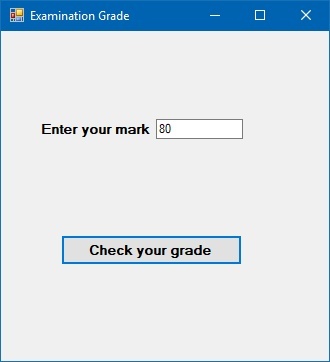 In this lesson, we shall learn how to write Visual Basic 2019 code that involves decision making. For example, we can write a program that can instruct the computer to perform a certain task until a certain condition is met. To write the code that involves decision making, we use the conditional operators and the logical operators together with the If..Then...Else keywords. In certain cases, we might need to make more than one comparisons to arrive at a decision. In this case, using numerical comparison operators alone might not be sufficient and we need to use the logical operators, as shown in Table 13.2. Logical operators can be used to compare numerical data as well as non-numeric data such as strings. In making strings comparison, there are certain rules to follows: Upper case letters are less than lowercase letters, "A"<"B"<"C"<"D"…….<"Z" and number are less than letters. To control the Visual Basic 2019 program flow and to make decisions, we shall use the If control structure together with the conditional operators and logical operators. There are three types of If control structures, namely If….Then statement, If….Then… Else statement and If….Then….ElseIf statement. In this program, we insert a TextBox and rename it as txtNum and a Button and rename it to BtnCheck. We write the code so that when the user runs the program and enter a number that is greater than or equal to 50 and less than 100, he or she will win a lucky prize. 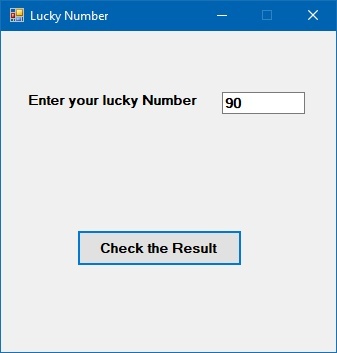 On the other hand, if the number entered is less than 50 or more than or equal to 100, the user will not win any prize. This program involves the use of the If and then keywords, the conditional operators and the logical operators Or and And. 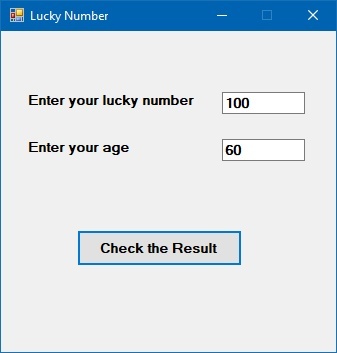 If you number is 100 and age is 60, you win a lucky price.